We’re celebrating Hispanic Heritage Month with our favorite Costa Rican soup dish! 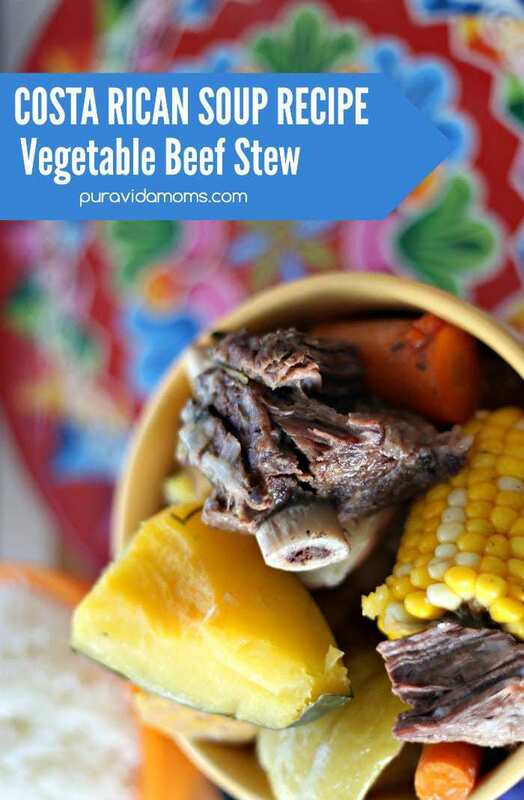 This hearty Costa Rican vegetable beef soup is packed with healthy vegetables and super easy to prepare. I remember returning to Costa Rica after a long absence- my husband and I had immigrated to the United States to get married and start our professional lives. The first years in the United States were marked with frenzy- starting careers, building a home, and making new friends. The last thing on our minds was cooking, even though food had always been a huge part of our relationship. When we returned to San Ramón for Christmas, we could hear the hiss of the pressure cooker before we even arrived at our doorstep. Walking into my husband’s childhood home to reunite with his extended family we were hit with the smell of olla carne cooking on the gas stove in the kitchen. In all the hustle and bustle of starting our lives in my native Colorado, we had forgotten to savor the simplest pleasures in life- sharing a bowl of soup with our friends and family. Since then, we make it a point to share this recipe with friends and family in Costa Rica and the United States. Olla carne was a first food for our daughters, a meal we share with new parents, and one that we prepare and share with fellow Costa Rican expats. The soup is not just a meal- it’s a symbol of the pura vida life. Because in the end, what is more “pure life” than sharing a healthy meal with those we love the most? 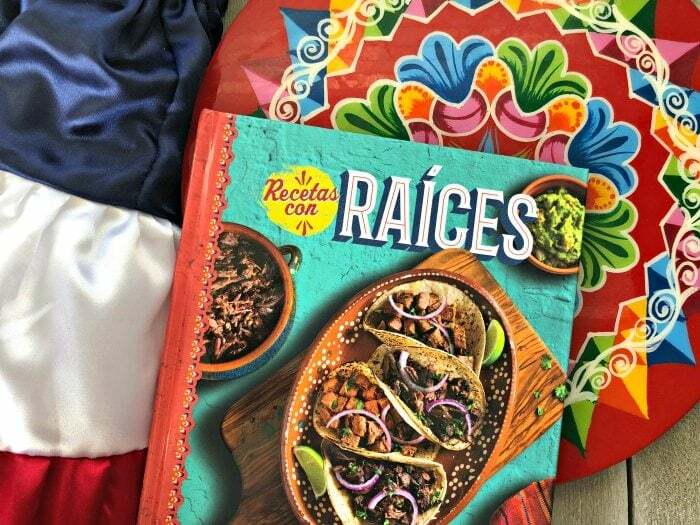 Every immigrant has a story about food from home, and Rumba Meats, who sponsored this post, is celebrating our Hispanic Heritage with a gorgeous cookbook in which they’ve rounded up the best recipes from all over Latin America, by the best latina food bloggers around. You can win a copy of the cookbook Recetas con raíces which features this recipe alongside 11 other recipes in a gorgeous cookbook format with stunning images and a celebration of our Latin roots. Enter the giveaway on the Rafflecopter below. We're celebrating Hispanic Heritage Month with our favorite dish! 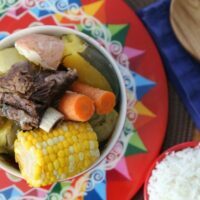 This hearty Costa Rican vegetable beef soup is packed with vegetables and super easy to prepare. Cooking the meat- Heat oil in slow cooker or pressure cooker. Sauté the chopped vegetables until tender. Add the meat and sear each side- cooking just until brown. Sprinkle the meat with salt and pour water on top. You should have about 6 inches of water above the meat- this soup needs a good amount of broth. Cook in slow cooker on high for 4-6 hours, on low for 6-8 hours. If using pressure cooker (preferred method) cook for 20 minutes after pressure starts to rise. Cooking the vegetables- As with the meat, heat the oil in a large stockpot, and then sauté chopped vegetables until just tender. Wash the vegetables, peeling if desired (vegetables are typically not peeled in Costa Rica). Quarter the potatoes, yams, and chayotes. Peel the yucca and cut into 3-4 large pieces. Cut the carrots and sweet corn into thirds. Slice the squash in half, remove the seeds, and then quarter cut each half into four large pieces. Place all vegetables into the pot, and sprinkle with salt. Cover with water and boil on medium heat until all vegetables are tender- about 1 hour. Serving the soup- In a large bowl, place 1-2 piece of meat with the bone, and fill about half the bowl with beef broth. Place the desired vegetables on top, and cover with the vegetable broth. Serve hot with a spare plate for bones and vegetable peels. Costa Rican Vegetable Beef Soup is often served with white rice, either at the bottom of the bowl or on the side. Disclosure: We’re celebrating Hispanic Heritage Month in partnership with Rumba Meats, who sponsored this post and giveaway. I love this kind of soup!! 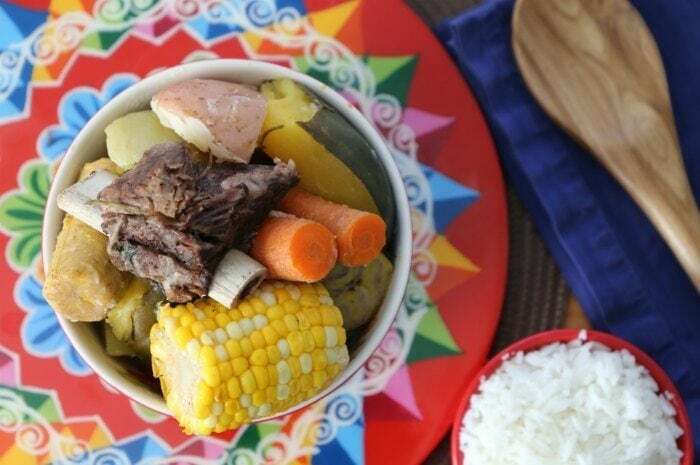 In Venezuela we call it Sancocho, a meal to feed a crowd!! I love most Hispanic food I’ve tried! Ones I like to make at home are simple…beans, rice, tamales, mole enchiladas. Some of the best food I’ve eaten was while traveling in Costa Rica! I can’t wait to try your recipe!